You'll be able to relax by the pool at whichever Texas Del Webb community you choose. It’s no surprise that 18 Del Webb communities landed on 55places.com’s roundup of the best age-restricted communities of 2018. For more than six decades, Del Webb has delivered the best in resort-style living for active adults. When retirees and active adult homebuyers explore a Del Webb community, they have come to expect world-class amenities, a vibrant, exciting culture, and, perhaps most of all, exquisite homes that are built with beauty and function in mind. Retirees who want to downsize from their family home in Texas or move to the Lone Star State can explore half a dozen Del Webb communities throughout Texas. Take a peek inside each community below. Situated in Georgetown, just 35 miles north of Austin, Sun City Texas stands out as the largest age-restricted community in Texas. 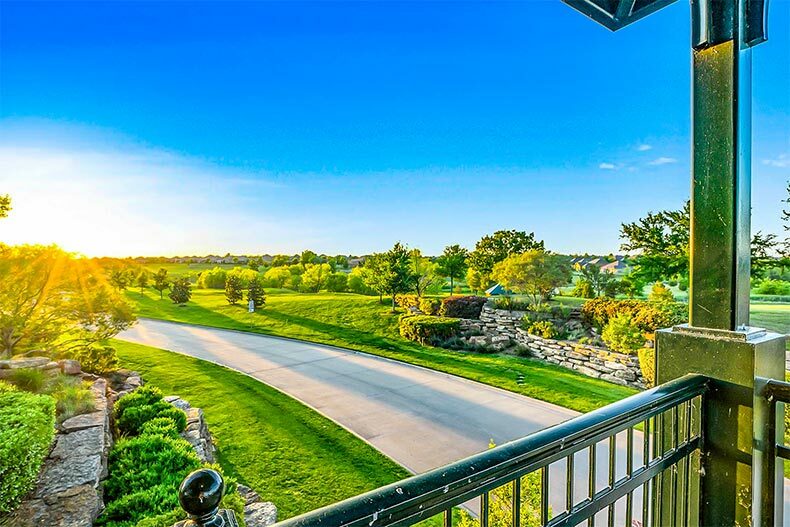 This spectacular community spans 5,300 acres and contains 9,900 homes and three 18-hole golf courses. Homeowners can stay as active as they like through a variety of clubs and activities, such as woodworking, bocce ball, and pickleball. Altogether, Sun City Texas offers more than 86,000 square feet of indoor amenities, including a billiards hall, computer lab, and library. Del Webb began this community in 1995. Active adult homebuyers can choose from an appealing mix of new and resale single-family and attached duplex homes. Whatever size home retirees are looking for, they can find it in Sun City Texas. Home sizes range from a cozy 900 square feet to a sprawling 3,000 square feet and up. Active adults can add elegant touches such as gourmet kitchens and spa-like bathrooms, allowing them to create the home of their dreams. Located inside a picturesque master-planned community in Little Elm, Del Webb at Union Park is a stunning new 55+ community offering residents an abundance of desirable amenities. Homeowners can socialize with friends at the clubhouse, relax by the sparkling outdoor pool, embrace their creativity in a painting class, refine their computer skills, or pick up a card game with neighbors. When it comes to staying physically fit, homeowners can take an evening stroll along the community’s walking trails, hit the tennis or bocce ball court, or swim some laps in the pool. Active adult homebuyers can browse a variety of single-family homes that vary from 1,400 square feet to 2,500 square feet. All are designed with two-car garages and include two or three bedrooms along with two or three bathrooms. Residents can savor a peaceful, countryside setting at Del Webb at Union Park and even take a stroll to Lake Lewisville. Those who desire the nightlife and energy of a big city will delight knowing they are only 45 minutes away from Dallas. Take in the splendid views at Frisco Lakes. Nestled in the heart of one of the country’s most desirable cities, Frisco Lakes offers active adults the kind of vibrant environment they have come to associate with the Del Webb name. This 55+ community offers residents a never-ending supply of interesting events and activities through two clubhouses and an 18-hole golf course that winds through the neighborhood. At the 28,000-square-foot Village Center and Sports Complex, homeowners can get their blood pumping at a state-of-the-art fitness center, twirl away at dance classes, or make a masterpiece at the arts and crafts studio. The fun continues outdoors, where residents can enjoy pickleball, horseshoe, and an outdoor pool and patio. Frisco Lakes, which was started in 2006, will contain nearly 3,000 single-family homes upon completion. Whether active adult homebuyers wish to move to a luxury villa or desire ample space with a large floor plan, Frisco Lakes delivers. Homes are available in a variety of sizes and styles, with many offering spacious great rooms, gourmet kitchens, and expansive outdoor living space. Hill Country Retreat stands out as an oasis in the Texas Hill Country, conveniently located near San Antonio’s many historic destinations. Homeowners experience a resort-style atmosphere from the moment they arrive at this luxurious 55+ community. At the entrance, cascading waterfalls and tall, leafy oak trees welcome residents. Peaceful lakes and winding trails add a tranquil touch to this neighborhood, giving joggers a beautiful backdrop any time of day. Active adult homebuyers will find many enticing floor plans, elevations, and amenities in Hill Country Retreat. Most homes are single-family, one-story homes, although some homes feature an optional second floor loft which can be used as an extra bedroom when family visits. 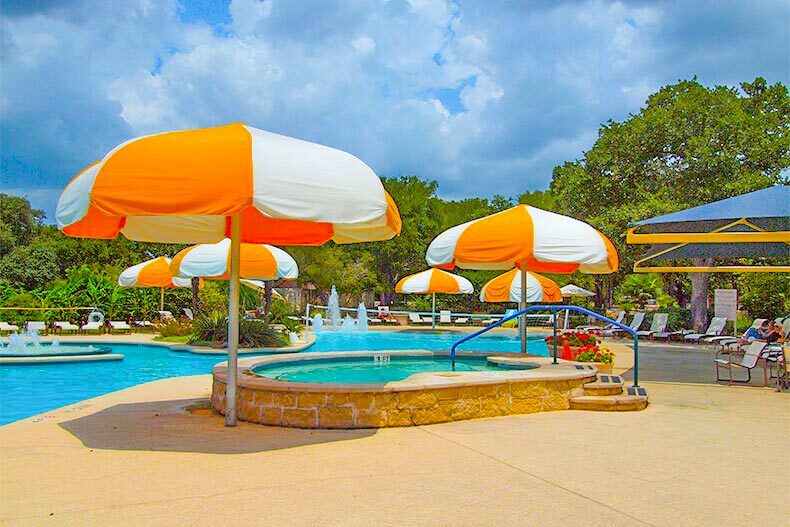 True to Del Webb communities, Hill Country Retreat offers homeowners an exciting way of life, whether they join groups for bowling and card games or they participate in Wednesday night movies or Friday night socials. Del Webb’s new 55+ enclave in The Woodlands sparkles with elegance and charm. Here, active adult homebuyers can make new friends and pursue an exciting lifestyle in ways that most appeal to them. This age-restricted community will contain an 11,500-square-foot clubhouse with a fitness center, card room, and arts and crafts studio. Neighbors can meet up at the billiards room, social lounge, or coffee bar. For enjoying the spectacular scenery, active adults can take advantage of the walking and biking trails that wind through the community. Del Webb The Woodlands contains two home series: The Classic Series and The Estate Series. Homes in The Classic Series range in size from 1,711 to 1,960 square feet, while The Estate Series features larger homes that range from 2,327 to 2,604 square feet. Active adult homebuyers will delight in Del Webb’s architectural consistency while maintaining their own personal touches with flex rooms and optional mini suites. Active adult homebuyers who want to enrich themselves socially and physically will savor living in Del Webb Sweetgrass. This 55+ community in Richmond offers a state-of-the-art recreation center along with a fully staffed clubhouse, an exciting array of fitness programming, a continuing education center, and a variety of sports courts. A resort-style outdoor pool, spa, and pavilion provide the perfect setting for relaxation. The community also contains a boat launch, outdoor amphitheater for concerts and performances of all kinds, and a fire pit for relaxing with friends under the Texas stars. Active adult homebuyers can select from three series within Del Webb Sweetgrass: Garden, Classic, and Estate. Each model allows homebuyers to choose from three exterior facades, ensuring that homes perfectly fit the homebuyers’ preferences. Some homes feature optional second floors and others offer premium views of water or green space.